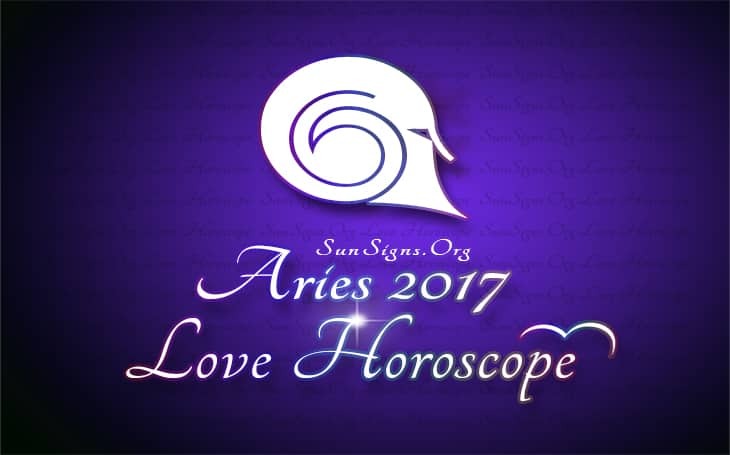 Aries Love Horoscope 2017 foretells that the House of Love and Marriage is not dominant this year for the Arians. Hence love and marriage will take a back seat. But that is no reason not to try your hand at gaining the support of the person you love. Single Rams will find friendships and social interactions more interesting than serious love commitments. This will give you an opportunity to enhance your social network by making more companions. Freedom with friends will be more enjoyable and you cherish the liberty with your friends. There will not be any change in the status of married Aries zodiac sign people and singles in the year 2017. Commitment which is the key to the success of a relationship will be missing in most. Relationships will be made and broken without much thought, thus leading to heart break in many cases while some will move on. The Aries 2017 love astrology forecasts predict that singles will find romantic alliances without commitment more alluring than marriage. Period after July 2017 will provide singles with many opportunities to get into love relationships. Period from September 2017 to November 2017 is also ideal for getting into love partnerships. These will be more for fun and entertainment and will not be serious affairs. Aries, you will find love while pursuing your educational interests. You may also get entangled with teaching professionals and intellectuals. The romance horoscope 2017 also forecasts that there are other possibilities of falling in love like dating people whom you have never met before. You may find a love partner while you are socially interacting with a family contact, a person of foreign origin or even a past lover. However these friendships may not culminate in marriages. You might even find your soul mate while flirting on online dating sites. Planet Venus is retrograde in 2017 and will spend about three months in the zodiac sign of Scorpio. This will impact all things connected with love such as marriages and love partnerships. There will be turmoil in these things and unless these upheavals are managed successfully. The chances of break-ups and divorces are imminent for the Aries man in love. Strong Aries love compatibility in bed will survive and become stronger. This might even end up in an unexpected pregnancy. Divorced Aries personality looking for a second marriage will be successful in getting a new loving partner after August. The Aries love horoscope 2017 foretells that Arians looking for third marriage will get many opportunities this year in 2017. Year 2017 is also not favorable for marital harmony and romantic relationships of children of the Aries personality. Love relationships are unpredictable and will undergo frequent changes. The emphasis is more on free-will and dedicated marriage compatibility is unlikely. Overall, the Aries love horoscope 2017 suggests that you need to tread carefully and not make any impulsive decisions this year in matters of the heart.